I have low water pressure. Will this work for me? You are here: Home / FAQs / I have low water pressure. Will this work for me? 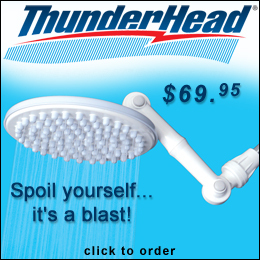 We designed ThunderHead to deliver a strong shower even in areas with low water pressure. There is an ultra-thin pressure chamber inside the showerhead that distributes the water flow equally throughout all 90 spray jets. The shape of the spray jets is actually designed to maximize spray force under low pressure conditions.